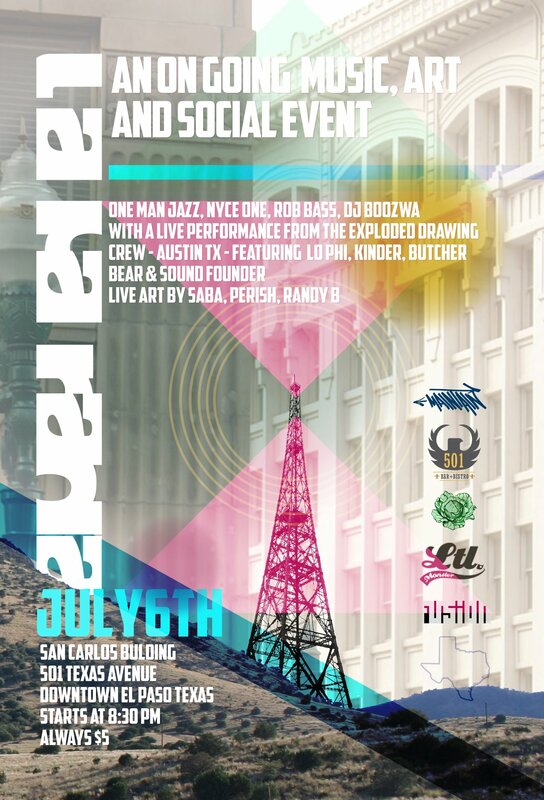 La Parada is an ongoing Arts, Music & Social Party held each and every First Friday of the month in Downtown El Paso. This month we welcome our like-minded friends from the North, Rude Behavior. Rude Behavior consists of veteran dj’s Vent and Crix Saiz and MC Ptrick. All 3 are staples in Northern New Mexico’s art and music scene and have years of performing under their belts. The La Parada courtyard is the perfect environment for their brand of future bass / future house business and these 3 are gaurantee’d to set the house on fire! Courtyard warm-up this month will be in the hands of the talented DEFTECH. Representing Listen:React and The Blacklight Project, DEFTECH is no stranger to big stages and soundsystems having opened up for The Martinez Brothers and other international acts last year. We hope you are as excited as we are to have him out for the first time. Inside we have got longtime Frontera Bugulu supporter and La Parada alum Birth Defects ready to set the tone of the evening with his original brand of cumbia, downtempo, hip-hop and all things funky. He’s a natural crowd pleaser and we’re always happy when he comes back to play for us. We also have a special live performance by reggae outfit, DUB CARTEL. They have steadily been making noise in the El Paso scene for quite some time now and their visit is long overdue. Their reggae riddims are sure to take the night over and whip us all into a good vibe frenzy. Drink specials announced day of. Be sure to check out the new craft brew selections inside the 501 Bar and Bistro!!! As always bring your smiles and your positivity and your friends. We can’t wait to see you all! The party kicks off at 8:30pm. Come celebrate life, drink and dance!!! Thats right! Producers from all over the southwest will be rockin the border this weekend! I’ll be smashing old and new shirts for your recycling needs… Bigthanks to everyone just tryin to stay afloat in this beautiful desertland divided by a white picket fence… Keep up the good work! This event has been a blessing to be apart of for the past year and a half…. 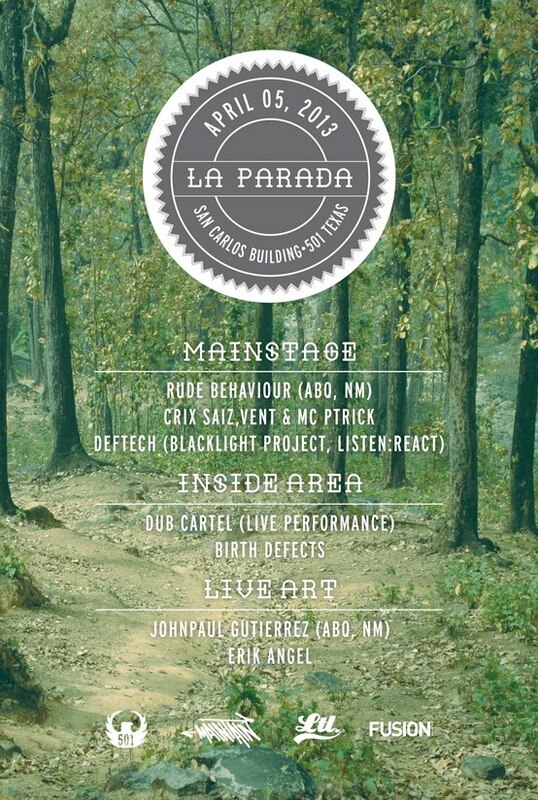 There is a huge support in El Paso for La Parada and many people travel from many miles to hear, see and feel the passion in the air from even more local artist…. 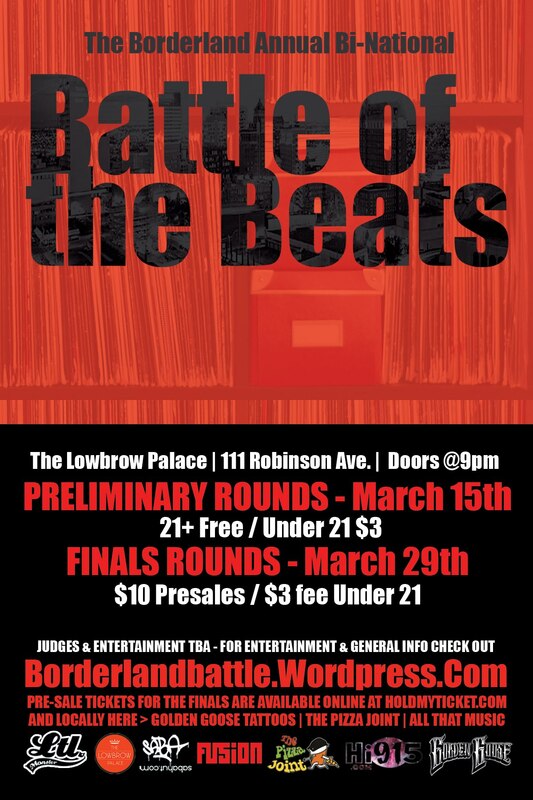 Mi Tierra: Traditional Hip Hop Battles. BBoy/BGirl and Graffiti Battles…. Live Prints by Sabawear..
First annual dance, graff art, music showcase. Brought to you by Siesta Kingz( Pharaohs of Phunk, Together With Style, Beat Munks Squad) in collaboration with Artson(Style Elements Monsta Squad). BBoy Battles, Popping Battles, Graffitti Battles, live concert, turntablists, food and fun for the entire family. Bringing back that raw hip-hop vibe to the Sun City. Sharpen up your skillz and rep your crew! Earn your stripes! This will be a gathering of the spirits to feed this culture we love, and has given so much to us all. The next generation is ready, El Paso is ready, are YOU ready? … stay tuned for exciting details.